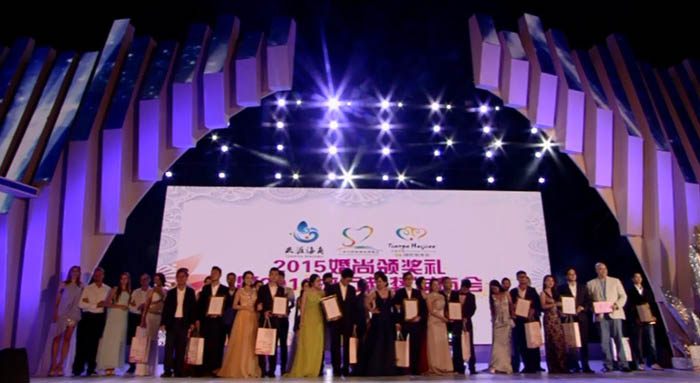 On 22nd December 2015, the 19th“Tian Ya Hai Jiao” International Wedding Festival was grandly open. This wedding festival themed “Internet +” staged two main activities: “Annual Wedding in ‘Tian Ya Hai Jiao’ ” and “Wedding Product Release Show”. The organizer also launched crowdfunding and auditions activities with network platforms including Jingdong.com, Fengniao.com, LOTUSMAN, and the True Love group. They used anecdotes to express the importance of mutual understanding, mutual trust, and deeds in love relations, and come to an interpretation that "companion, is a long-lasting commitment." 19 pairs of lucky couples selected through online voting were invited to “Tian Ya Hai Jiao” to take part in an unprecedented group wedding ceremony. “Annual Wedding in ‘Tian Ya Hai Jiao’ ” is one of the main activities of this wedding festival. The most popular among 19 lucky couples: Wang Daquan and Yang Guiping, is entitled to a custom-made wedding, themed “dreams will come true, lovers will meet at ‘Tian Ya Hai Jiao’ ”. The wedding is scheduled at the wedding hall at 5 pm of the 23rd. The internationally renowned wedding planning team "Bolin Wedding International" decorated the venue with regionally characterized theme of "undersea garden" and in the coral color of the sea floor, creating an atmosphere of romantic love. All participants can join the after party including the "bubble war" game and "romantic movies." In addition, at 10 am on the 22nd, the "Wedding Products Release Show" and “Tian Ya Hai Jiao micro-wedding release show” were launched in the “Tian Ya Hai Jiao” Tourist Area, which is planned for the remaining 18 lucky couples. The release show was planned by three famous boutique wedding planning teams in China. There are three themes: “Church Wedding” “Lawn Wedding” and “Beach Wedding”. 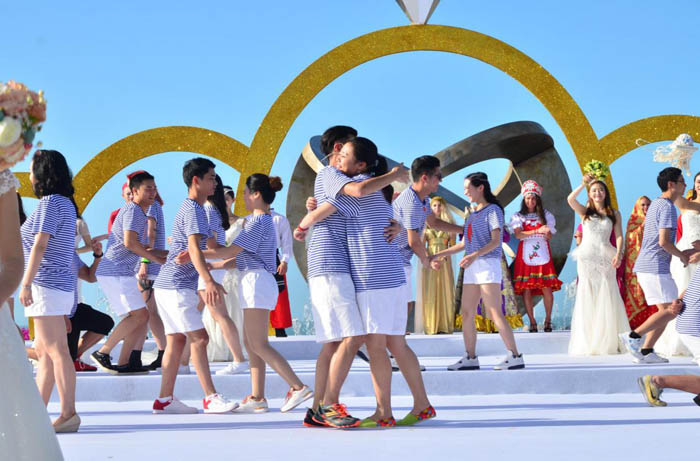 The public tourists voted on all themed weddings staged by three teams, and the winner awarded the “Wedding Dream Fund” from the organizing committee. Another important event of this wedding festival: “2015 Wedding Awards Ceremony and 2016 Fashion Trends Conference” was launched by the organizing committee of two major events: “China· Sanya ‘Tian Ya Hai Jiao’ International Wedding Festival” and “Sanya Destination Wedding Expo”. The "Awarding Ceremony" was themed "Destiny will bring you two to ‘Tian Ya Hai Jiao’ ", and latest fashion trends in cosmetics, watches, weddings and other related industries were released. The LOTUSMAN is the exclusively designated timepiece for the 19th Tian Ya Hai Jiao’ International Wedding Festival. 19 pairs of lovers were presented custom-made 19 pairs of couple watches by Liang Fubiao, President of LOTUSMAN in Asian area during the Ceremony, as a witness of their long-lasting love. Meet LOTUSMAN at the End of Earth (“Tian Ya Hai Jiao”) to be the witness of true love.